So for this set of memes, I’m continuing with the Morticia and Gomez theme. However, I’m going analyze a couple of artifacts in this collection, and their potential rhetorical success, a little differently. Instead of drawing inference based predominantly on expression and added text, I will draw on the well-known belief that Morticia and Gomez Addams are the embodiment of the perfect couple/love story. Basically, what I’m trying to say sort of inarticulately is–hey, let’s take a look at a few derivatives of this maco image and see what creators of these derivatives find comparable to Morticia and Gomez’s epic couple status. (Has sneaking suspicion this will be epic–or complete shite–either way, what bliss.) Anywho, this macro image also comes from the 1991 Addam’s Family movie directed by Barry Sonnenfeld and written by Charles Addams (characters), Caroline Thompson and Larry Wilson. 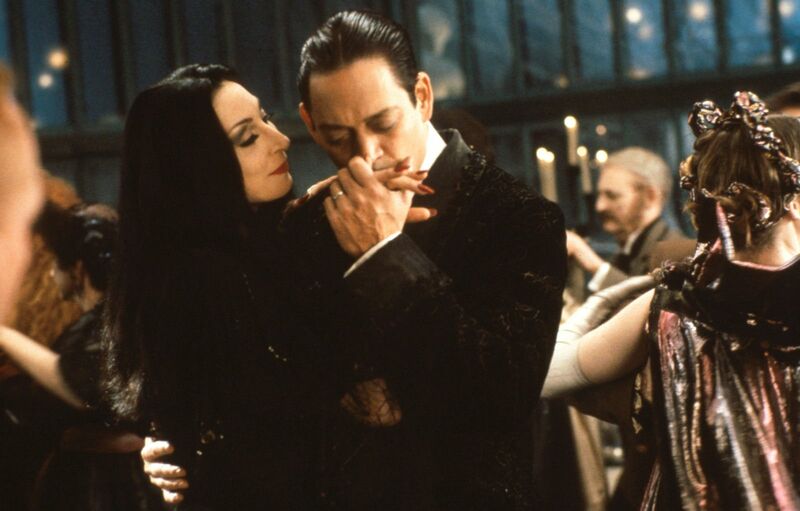 And we have, the brilliant portrayals of Morticia and Gomez as brought to us by Anjelica Houston and Raul Julia. Annoyingly, I can’t find a clip of this scene. Please enjoy this gif (that leads up to the affectionate embrace) instead. 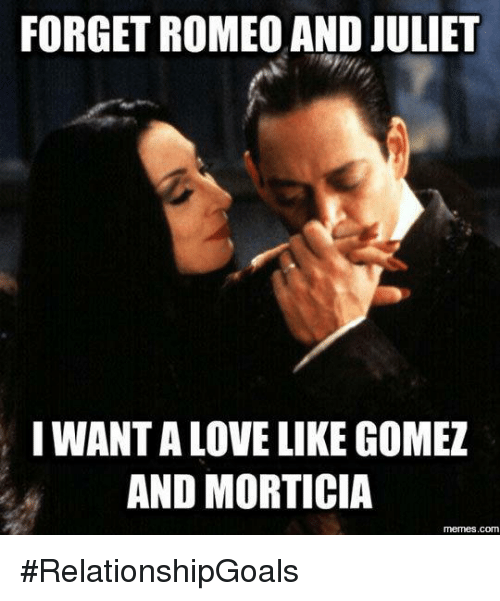 The example memes derive in part from Morticia and Gomez’s facial expressions (adoration, earnestness), however, they also derive from their epicness as a couple in love. Morticia and Gomez’s expressions of adoration and earnestness, do in fact inspire the image macros. With previous macro images, we know that the implied rhetor/s expressions are a reaction to an action. However, unlike previous examples, the creation of these derivatives is not inspired solely by something Morticia and Gomez are experiencing but rather what the actual rhetors are experiencing–an epic love story. Not only are Morticia and Gomez iconic characters, they are also an iconic couple, often described as “doing marriage right.” Because of this, the example derivatives will most likely be comparison memes. Can be found in non-animated form or gif form. As mentioned previously, Morticia and Gomez Addams are not only iconic characters individually, but they are also iconic as a couple. Thus identifiable to many, and relatable to some and on various levels. Morticia looks at Gomez adoringly as he kisses her hand in earnest. Their loving expressions are only for each other as they waltz and the audience/rhetor(s) look on. Devotion: because the implied rhetors will understand that the success of Morticia and Gomez as a couple goes deeper than love. In this macro image, Morticia and Gomez are having a “moment”–one of many. Metalingual: The derivatives exist because the rhetor(s) are “establishing mutual agreement on the code” (Shifman, 2014, p. 40), which, in this case, is to define what makes the perfect couple. 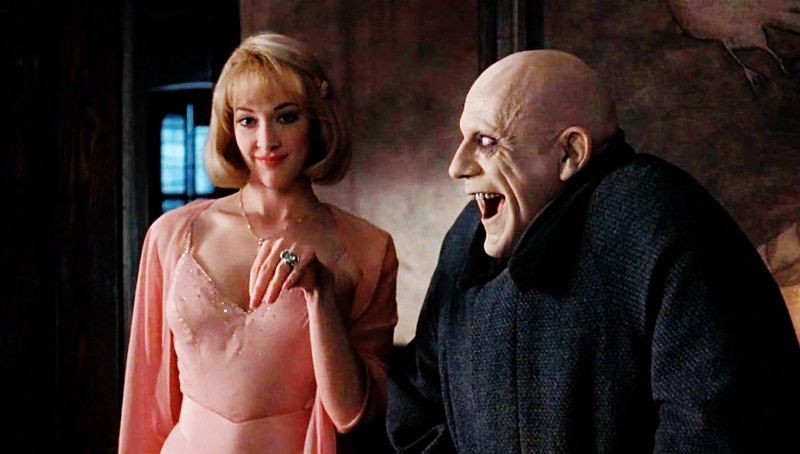 Isolated screenshot taken from a particular scene in The Addams Family movie. The creative potential for this macro image originates from Morticia’s look of adoration as Gomez adoringly kisses her hand as they waltz. Once again, the isolated screenshot is simple. “Simplicity is an important attribute contributing to the creation of user-generated versions of the meme” (Shifman, 2014, p. 81). Footer with a white background is now included with the hashtag “RelationshipGoals”. Unsure as to whether this is the original image macro, however, it is the most generated. Original image now includes text: “Forget Romeo and Juliet, I want a love like Gomez and Morticia.” It is clear that Morticia and Gomez are not the speakers because a comparison is being made between them and Romeo and Juliet. The addition of the footer with #RelationshipGoals is also a clear indicator of the creator’s preference. For people who believe that two people don’t have to die tragically to achieve epic love status, this meme is relatable and shareable. Meme-generating sites, like this, allow a person to create/recreate/remix memes numerous times by anyone who has access to the image and a meme generator. You can also download and share memes from its meme archive. Text is placed on image so as to not obscure Morticia and Gomez’s facial expressions. Genre: romance, comparative. The participants of the creation and distribution of this meme are more than likely fans of Morticia and Gomez Addams and believe that they are the perfect couple–in an epic way. Register: Teen to adult, amateur–relatable and inclusive to anyone who is familiar with the characters of Morticia and Gomez Addams and the tragic Romeo and Juliet. Metalingual: The derivatives exist because the rhetor(s) are “establishing mutual agreement on the code” (Shifman, 2014, p. 40), which, in this case, is to define who/what make(s) the perfect couple. In this derivative, the addressor is not solely relying on an inference of Morticia and Gomez’s expressions for the addressee to arrive at a conclusion. Instead, the inference also comes from the addressee’s knowledge of Morticia and Gomez as the perfect couple. However, the addressee must also have at least a Cliff Notes knowledge of Romeo and Juliet in order for this derivative to be successful. This is a remake of the original macro image. By including text at the top of the macro image the creator of the meme sets up the comparison. And delivers the rejection of comparison in the bottom text. The action is not only a shared approval of Morticia and Gomez winning at #relationshipgoals, but also a shared disapproval with the line of thinking that an epic love story has to end in tragedy. Whimsical: Once again, Morticia and Gomez Addams are definitely a part of our pop culture. They are iconic. Therefore, the audience majority are familiar with their no less iconic relationship. As I’ve said before, they are known in pop culture and fans of the genre as the perfect couple. Superiority: This may be stretching its definition–an interpretation of laughter as expressing the pleasant experience of one-upmanship (Shifman, 2014, p. 80) a wee bit, but I defend this by pointing out that the participants of this derivative are expressing a superiority in the success of Morticia and Gomez’s relationship vs Romeo and Juliet’s. Simplicity: ” . . . when people understand something quickly and intuitively they are happy to forward it to others. It also encourages memetic responses, since simple content is easy to imitate’ (Shifman, 2014, p.95). This derivative is a remake of the original image by simply adding text. Both the characters and the comparative are widely known, thus this meme is relatable and shareable. Does this meme show other features that spur memetic development, or features that seem to put an end to development? Yes. This derivative can be remade extensively. By simply replacing any couple that has been given the title of epicness, e.g. Tristian and Isolde, Jack and Rose (we’ve allll seen the diagrams–there was room for two on that damn slab of wood, Rose–tsk, tsk.) it can continue to be relatable and shareable. Parody? Satire? Nastiness? Now that’s a party. This is a fun artifact because it takes the 1960’s Morticia (Carolyn Jones) and the original Gomez (John Astin) and the 1990’s Morticia (Anjelica Houston) and Gomez (Raul Julia) and lets them play together. A mashup. I also love what qualifies as a “keeper” in this derivative. It’s very indicative of the genre. This artifact merges the original image of Morticia and Gomez with the 1960’s version of Morticia and Gomez. The expressions of Morticia and Gomez are adoring and ardent, but check out the expressions of our 1960’s Morticia and (especially) Gomez. More on that later. Text is added using a simple white font within a black border. This artifact is brought to us by Horroroftruant.com (although from the digging around I did, I believe it’s no longer active). I found that this artifact does connect/relate to other derivations, if not exactly, then definitely similarily. The top macro image is of 1960’s Morticia and Gomez; Gomez is the speaker. The bottom macro image is of 1990’s Morticia and Gomez; this Gomez is also the speaker. The combination of expressions and texts, lead the audience to conclude that not only is Morticia a keeper but so are any girls who love horror and Halloween. It’s also clear that the Gomezes approve this message. For anyone who is a fan of horror, Halloween, and the Addamses, this meme is identifiable/relatable. Construction of artifact and software used is (as in most cases) undetermined. Editing software was used to merge the two images into one, and altered to black and white: photo collage app (such as Pic Collage) or computer editing software (possibly, Photoshop) are two possibilities. Participants: the Morticias, the Gomezes, and creator(s) of artifact. The macro image is a visual representation of the creator’s appreciation for “ghouls” (girls) who love Halloween and horror. The Morticias are representative of those that are “keepers”. Where 90’s Morticia’s expression is adoring, 60’s Morticia’s expression is intense and direct. The 90’s Gomez is still ardently kissing Tish’s hand, but the 60’s Gomez has a direct gaze that, I feel, can only be described as a non-verbal “hell-to-the-yeah”! The distributors of this artifact are those who find the Gomezes description of the ideal girl/ghoul to be relatable and an all-around win in the relationship department. Conative: “oriented toward the addressee and available paths of actions” (Shifman, 2014, p. 40). The available path of action being communicated is to find the girl/ghoul of your dreams and treat her well. In this derivative, 90’s Morticia has an expression of adoration as she looks at Gomez, and 90’s Gomez kisses Tish’s hand ardently. Now, add both 1960’s Morticia and Gomez’s expressions (him–very pleased, her–intense with a slight smirk, both looking directly), and you have an action: “loves horror and Halloween” (60’s versions) and a reaction: “treat her like the ghoul she is” (90’s versions). Only with the combination of images and captions, can the audience be guided to this conclusion. This is a black and white remix of the original image. Here, we have a split image. The top image is of 1960’s Morticia and Gomez–representing the action bit of the artifact. Then, we have the original macro image of 1990’s Morticia and Gomez–representing the reaction bit of the artifact–directly below. The text comes in right between the 2 images in the common white, box lettering. The top frame is a combination of expressions and the portion of text that reads: “If she loves horror and Halloween” this infers “dream girl material”. The bottom frame is a combination of expressions and text that infers “she’s a keeper, treat her right”. This derivative is both relatable and shareable to any viewer/sharer who agrees that these criteria are key to finding “the one”. Prestige: “relates to users’ knowledge about the content’s source” (Shifman, 2014, p. 69). A blend of pop culture (both 60’s and 90’s versions for double the fun) and wordplay, spurs the artifact’s memetic success. Humor: I would consider this derivative as playful (79) humor. The combination of the 1960’s Morticia and Gomez expressions and the wordplay (changing out girl for ghoul) lends a playful tone to the derivatives message. Whimsical content: What’s more whimsical than finding the “ghoul” of your dreams? Does this meme show other features that spur memetic development, or features that seem to put an end to development? As with the “Morticia and Gomez are Halloween” artifact (last one collected), there is definitely room for memetic development with this derivative. One can switch out the criteria (horror and Halloween) for other things she (or he) must love. However, this derivative only remains successful as long as the criterion is relevant to who Morticia and Gomez are as a perfect couple. You can’t combine Friday the 13th and a full moon with Cinderella and Prince Charming; it simply won’t work. This artifact both fascinates and delights me on a multitude of levels. One being that at first glance the embraces of both couples are virtually identical, right down to the expressions on both couple’s faces. Now, one could make the assumption that this was the sole purpose for the creation of this meme, when, in fact, it goes much deeper than that, as anyone who is even the slightest bit familiar with the actor Robert Downey Jr will tell you. On the flip side of this, other’s may argue that this derivative does not achieve memetic success because of the different genres for which these couples are known. Yeah, well, you’d be wrong. I’ll defend these observations later on. Where the “Morticia and Gomez love connection” artifact would be defined as a mashup, this one would be a crossover. This artifact merges the original image of Morticia and Gomez (now cropped) with an image of Susan and Robert Downey, a couple that comparatively has an epic love story too. Unsure of origination but a watermark indicates it was shared (and possibly created) Lila Hiddles Cosplay. Does not connect or relate to other derivations; it is the only one of its kind that I came across. It’s definitely a fresh perspective. The first image macro is the origin image. It has also been cropped to keep viewer attention on Morticia and Gomez’s expressions. The bottom macro image is of Susan Downey and Robert Downey Jr. Morticia and Gomez, and the image of the Downeys are virtually identical in form and expression. The caption reads: ” . . . a love story like Morticia and Gomez, and Robert Downey Jr and Susan Downey.” The text is position between the two images. In this merged derivative, Morticia and Gomez are not the speakers nor are the Downeys. The participants of the creation and distribution of this meme are the actual speakers. The combination of loving embrace and expressions, along with the added text, lead the audience to conclude that both couples (macro images) are not so much the personification of the perfect couple, but they definitely have an epic love story. For anyone who has worked through life’s BS and not only managed to make it work but retained the passion, this meme is identifiable/relatable. Construction of artifact and software used is undetermined. Editing software was used to merge the two images into one. Photo collage app (such as Pic Collage or, as already mentioned, one of the gazillion others out there) or computer editing software (possibly, Photoshop) are two possibilities, or maybe even a combination of the two. Text is not the standard white, blocked lettering (although it is still white). The chosen font type, I feel, hints at a more conversational/intimate feel. Participants: The participants of the creation and distribution of this meme are more than likely not only fans of Morticia and Gomez Addams but of Susan Downey and Robert Downey Jr, as well, and believe that the latter’s love story rivals Morticia and Gomez’s love story in terms of epicness. Metalingual: ” . . . used to establish mutual agreement on the code, for example, a definition” (Shifman, 2014, p. 41). The creators and participants of the artifact are defining the relationship of Susan and Robert as epic by comparing them to Morticia and Gomez whose well-known love story is identifiable by a wide range of viewers, in the hopes of establishing a mutual agreement. In this derivative, the creator is not drawing inference on expressions and added text alone but is also drawing on the well-known belief that Morticia and Gomez are, in many ways, the perfect couple/love story. Morticia and Gomez’s expressions of adoration and earnestness do, in fact, inspire this derivative. However, the creation of this artifact was not inspired solely by something Morticia and Gomez are experiencing (or Susan and Robert, for that matter) but rather what the creator and participants are experiencing–not one, but two epic love stories. By merging two images together and adding text, we see a remix of the original image. The top image is of our original macro image, still smiling adoringly and kissing ardently, and representing those that are defined as the quintessential couple in love. Then, we have an image of Robert Downey Jr and, his wife, Susan Downey mirroring Morticia and Gomez’s embrace and expressions almost identically. They are also representing, what the creator believes, another couple with an epic love story. The mutuality is only evident if the participants are familiar with the history of the Downey’s, in particular, Robert’s journey back to health and success. Only then is this derivative both relatable and shareable. Prestige: “relates to users’ knowledge about the content’s source” (Shifman, 2014, p. 69). The memetic success of this artifact is contingent on the audience’s knowledge of Robert’s tenacious journey back to the top and the steadfast love and support (and sometimes tough love) of his wife, Susan. Provoking “high arousal” emotions: ” . . . people share content that arouses them emotionally—both positively and negatively. Positive high-arousal is embedded in what the authors tag as “Awa” stories” (Shifman, 2014, p.67). Honestly, if the Downey’s story of support and survival isn’t an “awa” story, well then, I don’t know what is. So many feels! Simplicity: ” . . . coded as employing a simple construction of their topics or ideas . . . Simplicity is an important attribute contributing to the creation of user-generated versions of the meme” (Shifman, 2014, pp. 81-82). 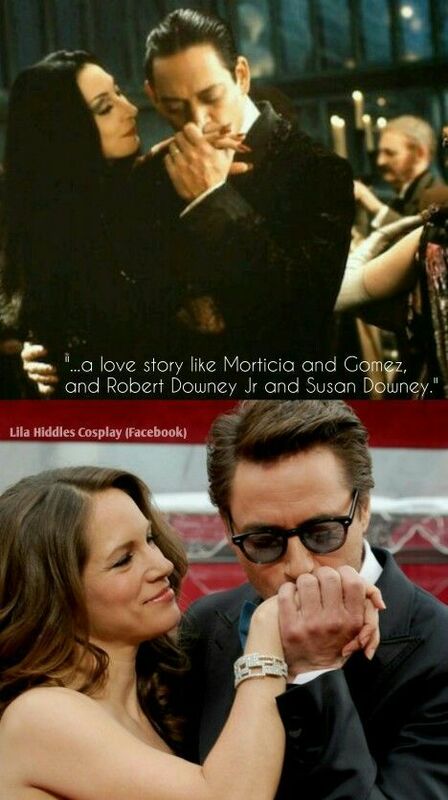 Although this derivative merges two images together with text, the message is a simple one: “a love story like Morticia and Gomez, and Robert Downey Jr and Susan Downey.” By making this comparison, the creator informs by example. Does this meme show other features that spur memetic development, or features that seem to put an end to development? Yes, it’s possible that this artifact will spur further memetic development. As long as the couple being elevated to Morticia and Gomez status truly deserves the comparison. For instance, if you try to replace Robert and Susan’s image with that of Kim and Kanye, and then share it to any social media platform, I will unfriend and block you–just sayin’. Single use of image. Image has been altered so that Morticia and Gomez are now in black and white, also background images have been faded out to a solid black background. Text is added using a standard, meme-generated, white font. Original image now includes a top text: “I’m just a Morticia,” and a bottom text: “Looking for my Gomez”. Neither Morticia nor Gomez are the speakers, but rather someone describing themself as someone like Morticia (a Morticia). This derivative is for people who identify with Morticia and appreciate the way Gomez treats his lady, recognizing the success of their relationship. Construction of artifact and software used is undetermined. However, judging by the editing done to image, my guess would be any computer editing software (most likely Photoshop for black and white editing, including background). The original image was then altered (and most likely uploaded to a meme-generating site, although there is no watermark to indicate this). Text is placed on image so as to not obscure Morticia and Gomez’s facial expressions (the motivation for the added caption). Genre: Gothic, romance, communication. The creator of the artifact appreciates the type of relationship Morticia and Gomez have and recognizes what (she) is looking for in a mate. The rhetor may not necessarily identify with Morticia on an individual level, but (she) definitely does as one half of a perfect couple. Register: adult, amateur, relatable and inclusive to anyone who thinks Gomez Addams is Mr. Right–or more importantly, how Gomez is with Morticia. It’s essentially the rhetor’s mating call–so to speak. I believe the primary communication function is emotive: “oriented toward the addressor and [her] emotions” (Shifman, 2014, p. 40), however, I also feel that the referential function comes into play here as well–“oriented toward toward the context” (Shifman, 2014, p. 40). I defend this by pointing out that the addressor is making a statement and Morticia and Gomez are the examples. For this derivative, I’d like to focus on its packaging. As I’ve pointed out before, Shifman (2014) explains that the clear and simple spread better than the more complex (p. 69). The creator of this derivative has altered the original macro image to its most simple form–black and white with a black background. By doing this, they have put the sole focus–the spotlight–on Morticia and Gomez’s expressions and embrace. With the addition of text, inference is drawn. I’m declaring this derivative a remix, essentially because of the above-mentioned alterations to the original macro image. Whimsical: This one’s going to be a frequent flyer while visiting the land of Addams. They are iconic. 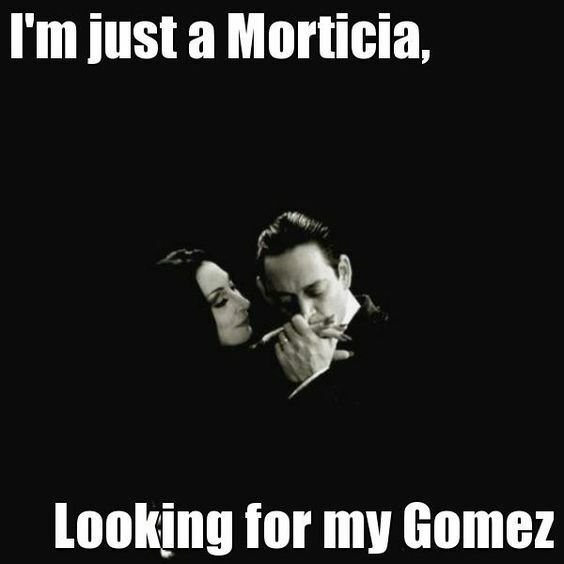 Morticia and Gomez’s love is epic. Therefore, the majority who find this relatable and shareable want to find the kind of love that they have found. Simplicity: Although this derivative is a remix of the original image, it remains simplistic in form–perhaps even more so. Ordinary people: I’m aware that this derivative does not fit Shifman’s (2014) definition (p. 74) exactly, but I feel it still fits. Although this derivative, at first glance, seems to be celebrity-focused (image of Morticia and Gomez), it is, in fact, ordinary-people-focused because of the added text. By focusing on what Shifman (2014) points out as the “you-ness” of the derivative, we recognize its success. Does this meme show other features that spur memetic development, or features that seem to put an end to development? I believe the memetic development of this meme is limited. One could switch it around: “I’m just a Gomez, looking for my Morticia.” Although, I suppose you could parody this meme by replacing Morticia and Gomez with Uncle Fester and Debbie: “I’m just a Fester, looking for my Debbie.” It wouldn’t work the other way around, though, I feel, because the Addams family were Debbie’s doom. Not to mention she wasn’t looking for an epic love story. I’m picturing this for the macro image for that one. This is the one exception to the collection of derivatives. Here, we go back to analyzing the combination of Morticia and Gomez’s expressions and added text to determined the creator’s inference. Single use of image macro presents not only a noir version of the original but a mirrored version as well. Original image has also been cropped for a tighter frame of Morticia and Gomez. Added text is the uncommon choice of gray and chosen font tells us this meme was not created using a standard meme generator. Does not necessarily connect or relate to other derivations other than the use of original image, and, as already pointed out, even that’s been altered. Slight variation of original image (mirrored) and is now presented with a noir filter, includes text: “When we’re together, darling, every night is Halloween”. *This is an actual quote from the Addams Family TV series. Morticia says the line to Gomez. The choice to edit the image with a noir filter actually adds to the gothic feel (one way to describe the Addams family genre). Morticia’s look can still be interpreted as adoring, and Gomez’s look still shows his ardency. The caption, along with the interpretation of their expressions, implies that Halloween is their favorite time of year–to celebrate this every night–pure bliss. Let’s also note that the caption chooses Halloween every night as the descriptor, not every day, this speaks to the genre. This meme is directed at people who are not only familiar with Morticia and Gomez but also know what joy celebrating Halloween every night would bring. Construction of artifact and software used is undetermined. However, a Google search of the watermark at bottom right (m-y-v-a-m-p-i-r-e) would lead us to conclude they are the creator. Nonetheless, it is more likely that they are not the creator, but instead, found the already created meme and slapped a watermark on it (much like the “Morticia and Psychos” derivative found here). The original image was uploaded and altered, text is added using any editing app (such as Snapseed or Typorama). Photoshop is another possibility but because of the editing style, I’m leaning toward one of the first mentioned. Text is placed on image so as to not obscure Morticia and Gomez’s facial expressions (the inspiration for the caption added). Genre: Gothic, romance, communication. For the creator of the artifact, he or she more than enjoys Halloween–they live for it. And for them to compare this passion to that of their love for someone, well that’s purely epic. By using such a strong comparative, the creator of the artifact can express the depths of their love for their mate in a clear and effective (not to mention totally cool way. Emotive: This derivative exists because of the looks on Morticia and Gomez’s faces. Conative: “oriented toward the addressee and available paths of actions” (Shifman, 2014, p. 40)–the creator of the image macro is addressing their mate. The available paths of actions are–well–most likely of a romantic and intimate nature (insert eyebrow wiggle here). In this derivative, we go back to drawing inference from expression and text. Morticia looks at Gomez in adoration as Gomez kisses Tish’s hand with passion. Even though quite a few alterations have been done to the original macro image, this artifact is a remake. By including text at the bottom of the macro image, the addressees’ eyes focus on Morticia and Gomez’s expressions, allowing one to “feel the love” before drawing inference by reading the caption. The action is actually a reaction to their love for each other and Halloween. If successful, the end result is a shared agreement by the creator, distributor, and viewer of loving your mate–just–that–much. Provoking “high arousal” emotions: “. . . people share content that arouses them emotionally— both positively and negatively. Positive high-arousal is embedded in what the authors tag as ‘Awa’ stories” (Shifman, 2014, p. 67). This artifact fits the description–one being told by their mate that every night is Halloween when they’re together? Talk about your war and fuzzies! Simple Packaging: Shifman says, ” . . . when people understand something quickly and intuitively they are happy to forward it to others” (Shifman, 2014, p. 68). Once again, this derivative fits the description perfectly. Even though it doesn’t have the standard look of a generated meme (it doesn’t get much more simplistic than that), this artifact isn’t visually “busy” nor is the message unclear. Whimsical: Once again the fact that Morticia and Gomez Addams are a well-known part of our pop culture, not to mention the bringing of Halloween into the mix (the only Holiday that truly matters, IMO), delivers an artifact that simply drips whimsical! Does this meme show other features that spur memetic development, or features that seem to put an end to development? There is definitely room for memetic development with this derivative. I mean, just switch out Halloween with red-hot pokers and leather straps and let the fun begin.